The well of souls tri-umvirate was the brainchild of Maurice Hackett. Between 1989-1991 he held a series of moving parties called the "Blue Ball." These featured heavy emphasis on lighting and atmosphere to generate a club like environment where all the guests were welcomed and encouraged to perform. Poetry, theatre, and rap were frequently present and the success of the parties encouraged Moe to make the next step. 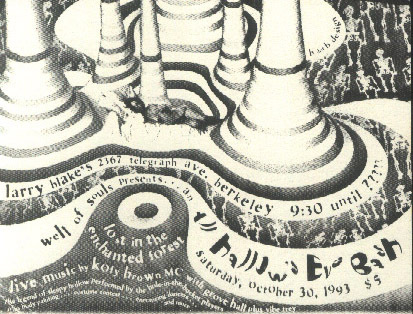 The Berkeley Square, a famous night club that helped start such famous bands as Primus, Green Day, and many others whose names have fled from memory, agreed to allow Moe to setup weekly Sunday shows for free. Moe then contacted a friend and thespian, Rich Reinholdt, to help him in the planning. Together they booked several performers including the then up and coming Broun Fellinis, a photographer, 2 painters, and 3 poets to perform. The show would consist of multiple performances, DJ, an art gallery, and again Moe's famous ambiance. 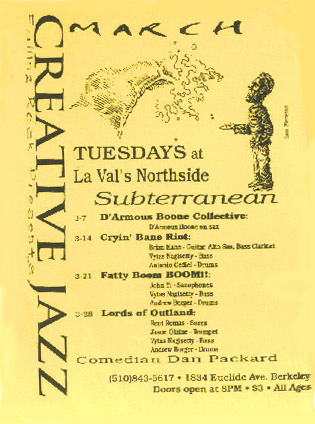 The first show was scheduled for May 16, 1991. A couple weeks before the first show one of the poets booked to perform contact Moe and asked permission to do some extra advertising. On learning the voluntary nature of Moe and Rich's endeavor he also volunteered to help with the setup the day of the show. This introduced the third partner, Damon Anderson, and the well of souls triumvirate had been formed. The show was a great success. The Berekeley Square was always a bit of a dive. But that night the Square was tranformed. Tablecloths, candles, colored lights, and a curtained off art gallery turned the grundge club into a jazz club, and with the excellent addition of Loren White running the top of the line sound system and Meyer's Sound speakers, a better venue couldn't have been asked for. We of the well of souls would like to thank sincerely everyone and anyone who was involved with our productions. There are so many friends and contributors that were especially important. We couldn't have done any of it without you. ... as I was saying after three years the partnership split up. The well of souls did not die, but labor and living overwhelmed the three. Rich Reinholdt, now heavily involved in theater performances, including a production of Through the Looking Glass with Lucy Liu, needed more time and energy to devote to acting. Moe has continued to think tank and is constantly on the lookout for the next opportunity and venue to host well of souls. Damon Anderson spun off Falling Rock Productions, a private subsidiary of well of souls to continue with what the triumvirate had begun. Working singly for 2 more years he continued to produce weekly avant-garde jazz and jazz improv shows, moving to La Val's Subteranean theater, and then to the infamous Stork Club in Oakland. He soon added KALX radio show Arts in Review to his heavy load as well. 510 Starry Plough. But 2 years was wearing and eventually we all need to move to new pastures. Yet, still there was more to do, and being freed from the weekly 10 mile flyering walks and weekly headaches of managing booking, advertising, the stage, and the door gave Damon a little time to study HTML. As 510 Arts & Culture was also falling on hard times after the publication of their 4th semi-annual art magazine, and yet to cover their margins. Damon struck on the idea of taking the next step and moving to the internet. The initial purpose of well of souls, Falling Rock, and 510 were to create a venue and open up doors for up and coming and unknown artist of great talent and skill. In this endeavor all three were successful. Now Damon thought he could open the door internationally instead of just the SF Bay Area, by making an online museum for the arts. Thus www.fallingrock.net was born. wellofsouls.com was also published with the intent of turning it into a free hosting site for artists and their art. Unfortunately in a lapse of payment to the Internet name registry, the address was lost. Also, while Falling Rock was a well known name in the Bay Area, it was certainly not a nationally known monicur and something more relevant was needed. Which brings us to our current name address of artpoetryfiction.com. After 11 years, our goals have only grown, our experience and new skills continue add up, and the time is now. So please come in and see what we have to offer, and if you are an artist join our growing community. I checked out your 'history'...I do still remember my first night of participation in a Well of Souls event at Berkeley Square, very excited to exhibit my paintings, and met alot of good folks - I think it was the first time we met - Beki introduced us. Soon after, 510 was born, and 4 years of shows, readings, collating parties, etc....alot of fun! I'm glad you're still at it (via the Web).